Auditory thresholds in Clrn1ex4–/– and Clrn1ex4fl/fl Myo15-Cre+/– mice. (A) The Clrn1-floxed mice (Clrn1ex4fl/fl) were engineered by addition of loxP sites on either side of exon 4. 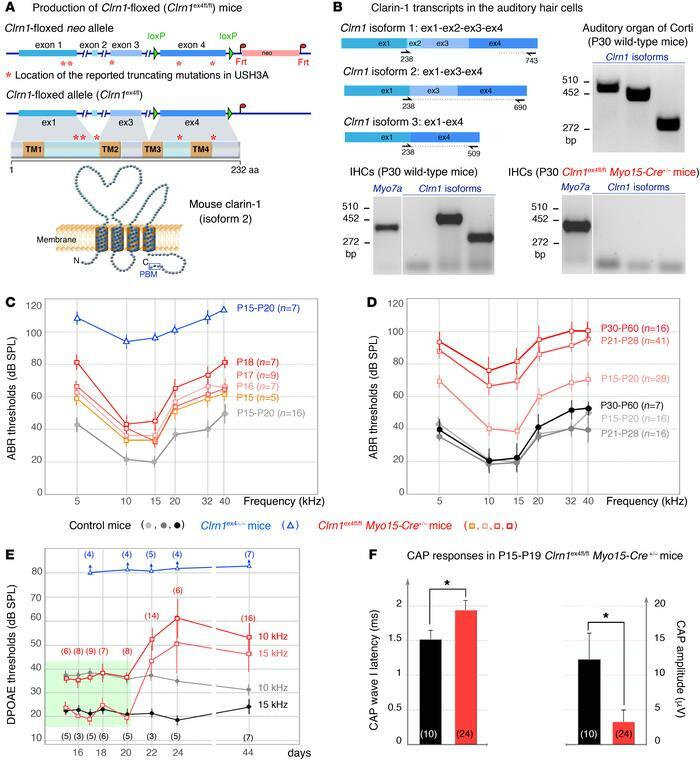 Clrn1ex4fl/fl mice were crossed with PGK-Cre+/– mice to achieve the early and ubiquitous elimination of clarin-1 (Clrn1ex4–/– mice), and with Myo15-Cre+/– mice to target clarin-1 elimination specifically to hair cells at postnatal stages (Clrn1ex4fl/fl Myo15-Cre+/– mice). A topological representation of the murine clarin-1, a protein containing 4 transmembrane domains with a C-terminal type II PDZ-binding motif (PBM, boxed), is shown. (B) RT-PCR shows mRNA expression of Clrn1 isoforms 1, 2, and 3 in the organ of Corti (P30) and only isoform 2 and 3 in P30 WT IHCs. Note that the expression of all isoforms is absent in P30 IHCs from Clrn1ex4fl/fl Myo15-Cre+/– (see uncut gels in supplemental material). (C) ABR thresholds in Clrn1ex4fl/fl Myo15-Cre+/– mice (light orange to dark red curves; mean ± SD) show a progressive increase between P15 and P18. A gray curve (control mice) and a blue curve (Clrn1ex4–/– mice) for P15–P20 are also shown. (D) In Clrn1ex4fl/fl Myo15-Cre+/– mice (red), ABR thresholds (mean ± SD) progressively increase to reach severe deafness at P21–P28 as compared with those in control mice (gray-black). (E) DPOAEs are absent in Clrn1ex4–/– mice (blue) as early as P15. By contrast, Clrn1ex4fl/fl Myo15-Cre+/– mice (red) display unaffected DPOAE thresholds up to P20 (green area). From P20 onward, DPOAE thresholds slowly increase by about 20–30 dB SPL. (F) Compound action potential (CAP) responses on P15–P19. CAPs were produced by 10-kHz, 95-dB-SPL, tone bursts. Bar charts represent CAP wave I latency and amplitude, which are significantly delayed and reduced, respectively, in Clrn1ex4fl/fl Myo15-Cre+/– mice. *P < 0.05 (2-tailed unpaired t test with Welch’s correction, n in the figure).